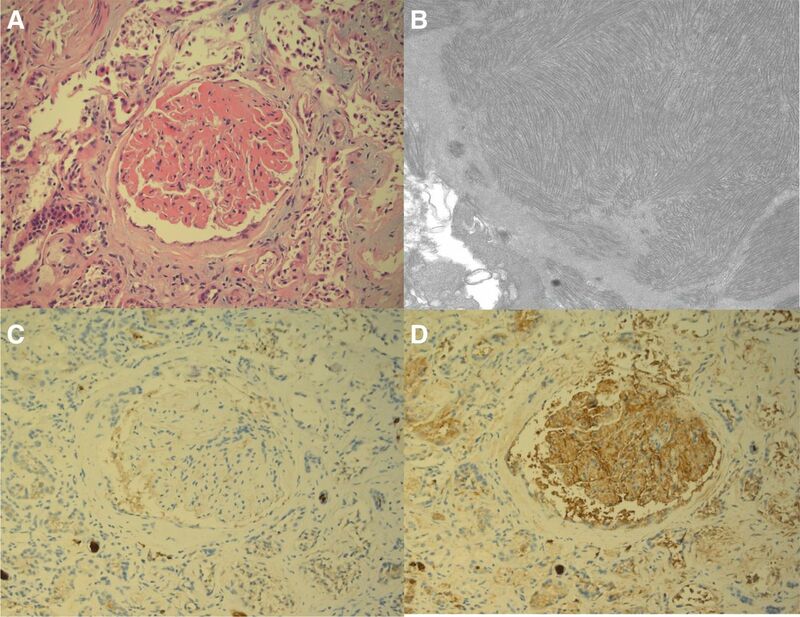 The monoclonal gammopathies of renal significance (MGRS) are a group of disorders characterized by monoclonal Ig deposition in the kidney, but are not associated with systemic lymphoma or overt multiple myeloma. The prevailing hypothesis is that the pathogenic paraproteins in MGRS are produced by underlying B cell or plasma cell clones. However, in the MGRS literature, the yield of detecting a clone has been variable, and progression to ESRD is common. Here, we present an “onco-nephrologic” approach to the MGRS disorders by highlighting recent advances in lymphoma and multiple myeloma that can be used in the evaluation and management of these patients. There exists a group of renal disorders that has recently been termed monoclonal gammopathies of renal significance (MGRS), which collectively describe kidney diseases due to monoclonal Ig (MIg) deposition but do not meet criteria for overt multiple myeloma (MM) (i.e., bone lesions, hypercalcemia, or anemia) or systemic lymphoma (i.e., enlarged lymph nodes or constitutional symptoms) (1). These disorders include immunotactoid glomerulopathy, type 1 cryoglobulinemic GN, the MIg deposition diseases (light chain deposition disease and heavy chain deposition disease), proliferative GN with MIg deposits (PGNMID), and paraprotein-associated C3 GN (Figures 1 and 2) (2). Histologic features vary between MGRS disorders, and it remains unclear if many of these manifestations are clinically relevant. Extrarenal involvement of the paraprotein has been described in some MGRS entities, whereas for others, such as PGNMID, cases have been renal-limited. Progression of renal disease is common after diagnosis, with high rates of progression to ESRD (Table 1), and recurrence after kidney transplant has been described (3–11). Immunotactoid glomerulopathy. (A) Light microscopy demonstrates massive expansion of the mesangium and capillary walls with eosinophilic material (hematoxylin and eosin stain; original magnification, ×200). (B) Electron microscopy shows fibrillar and microtubular electron-dense deposits in parallel and herringbone-like arrays, with average fibril diameter approximately 35 nm (transmission electron micrograph; original magnification, ×20,000); immunohistochemistry is (C) negative for λ and (D) positive for κ in the mesangium and capillary walls (immunoperoxidase stain; original magnification, ×200). Original figure provided courtesy of Dr. Matthew Palmer, Department of Pathology and Laboratory Medicine, University of Pennsylvania. Proliferative GN with monoclonal IgGκ deposits. (A) Light microscopy shows mesangial proliferation and sclerosis with segmental endocapillary and membranoproliferative changes (periodic acid–Schiff stain; original magnification, ×400); immunofluorescence shows positive mesangial and capillary wall staining for (B) IgG heavy chain and (C) κ light chain, while (D) λ light chain is negative (direct immunofluorescence; original magnification, ×400). Original figure provided courtesy of Matthew Palmer, Department of Pathology and Laboratory Medicine, University of Pennsylvania. In all these disorders, the presence of MIg in the kidney indicates the presence of an underlying expansion of clonal B cells or plasma cells that produce the pathogenic Ig. Therefore, it would seem ideal that diagnostic and therapeutic strategies in MGRS (as described below) should focus on the detection and eradication of these pathogenic clonal cells. However, such a clone-specific approach presents several challenges. Clinical challenges include evaluation by a multidisciplinary team that includes nephrologists and hematologists with expertise in these conditions. Diagnostic challenges include applying a uniform approach with sensitive techniques for identification of the underlying clone. Therapeutic challenges include choosing the most effective and clone-specific treatment available with the safest adverse event profile, particularly when no B cell or plasma cell clone is detected. Lastly, hematologic and renal outcomes are not standardized across the MGRS disorders. In this review, we focus on the hematologic perspective of MGRS, diagnostic approaches to identify clonal populations, the broad array of available therapies, and how these may be applied rationally and safely in the context of MGRS. We provide three illustrative cases for clinical context. In doing so, we intend to provide an accessible framework for both hematologists and nephrologists to approach MGRS in a harmonized fashion. When Are B Cells or Plasma Cells Dangerous? The fundamental clinical questions in the diagnostic management of patients with an MIg disorder are: does this patient have a B cell or plasma cell cancer and/or is the MIg causing organ damage? Approximately 3%–4% of the population aged >50 years have a circulating MIg, usually detected during the evaluation of various clinical signs and symptoms such as fatigue, weight loss, anemia, renal insufficiency, proteinuria, or back pain (12). However, the majority of patients do not have overt cancer or organ damage and are subsequently diagnosed with monoclonal gammopathy of undetermined significance (MGUS) (13,14). The term MGRS was coined to describe cases in which the MIg causes kidney injury but there is no evidence for overt lymphoma or MM (1). The success of detecting a specific clone varies across renal histology and individual case series (Figure 3). Among all cases, 38% have no identifiable clone. In the most recent case series on light chain deposition disease, a plasma cell clone was detected in nearly all cases (7). In contrast, a specific clone was only detected in 5% of patients with PGNMID in the first large published case series of this disorder, and 25% in a subsequent PGNMID case series (4,15). These results must be interpreted carefully as they are retrospective and hematologic investigations were not uniform. Moreover, the serum-free light chain assay was only introduced in 2001, and its use has not been employed in much of the MGRS literature. A sensitive and standardized approach to identifying paraproteins and clones, as described below, is needed to establish a more accurate rate of clone detection in MGRS. The types of clones identified in MGRS in the major case series. ITGN, immunotactoid glomerulopathy; LCDD, light chain deposition disease; MIDD, monoclonal Ig deposition disease; PGNMID, proliferative GN with monoclonal Ig deposits. Data from previously published studies (3–7,15). It is imperative to recognize that the absolute number of clonal cells may not correlate with disease burden from the MIg. In their classic review, Merlini and Stone (16) describe the MIg-mediated disorders as arising from “dangerous small B-cell clones.” For context, a normal bone marrow may have up to 3% polyclonal plasma cells. Patients with MGUS have <10% clonal plasma cells. Patients with smoldering MM may have 10%–59% clonal plasma cells. The updated criteria for active MM requiring therapy includes patients with ≥60% clonal plasma cells. However, the critical distinction between MGUS/smoldering MM and MGRS is not the quantity of the plasma cell clone and its secreted paraprotein, but whether it results in end organ damage. Amyloid light-chain (AL) amyloidosis is an instructive example: a disease associated with significant end organ damage, morbidity, and mortality, yet the majority of patients have bone marrow biopsies exhibiting <10% plasma cells (17). The diagnostic approach in MGRS should similarly be sensitive enough to detect “small” plasma cell and B cell clones that do not meet criteria for overt lymphoma or MM. Extrarenal symptoms should prompt evaluation of those organs for involvement by the paraprotein. As stated above, the presence of clonal Ig deposition in the kidney indicates the presence of a clonal expansion of plasma cells or B cells that are secreting this paraprotein. 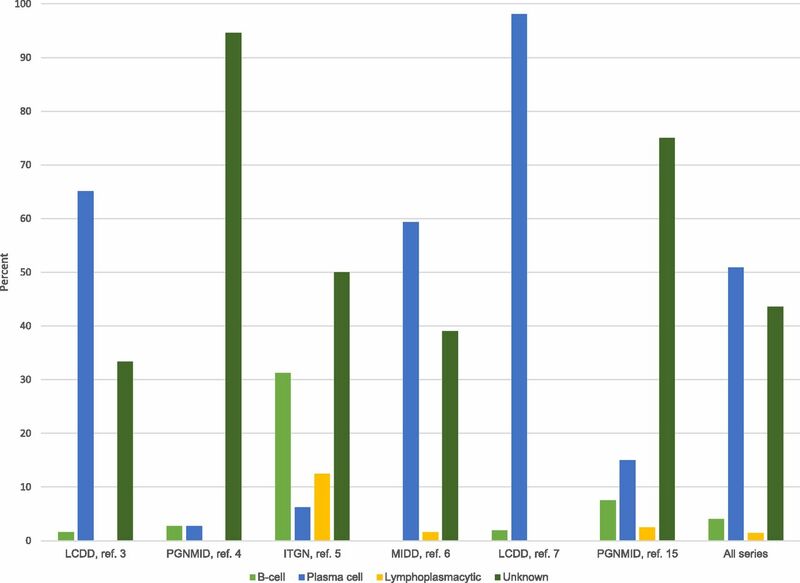 In the context of MGRS, these clonal expansions do not meet criteria for MM or systemic lymphoma, as they are not associated with frank neoplastic involvement of the bone marrow, lymph nodes, or extralymphatic organs. All patients with clonal Ig deposition in the kidney should undergo serum protein electrophoresis with immunofixation, 24-hour urine protein electrophoresis with immunofixation, and serum-free light chain analysis (FreeLite; The Binding Site, Birmingham, UK) (14,18). Utilizing all these tests, virtually all patients with circulating MIg will be detected. A detailed discussion of the laboratory diagnosis of lymphoproliferative clones is beyond the scope of this review, but a broad overview of the evaluation of plasma cell and B cell clones is provided. The isotype of the deposited and circulating MIg (IgG, IgA, IgM, κ, or λ) is not helpful in determining the underlying clone, although the presence of a clonal IgM suggests a B cell or mixed B and plasma cell (i.e., lymphoplasmacytic) clone. Characterization of the underlying clone requires sampling of the bone marrow, peripheral blood, or a pathologically involved lymph node. Morphologic examination of these tissues can usually suggest the type of underlying clone, but further characterization with additional techniques is needed to confirm both that the expansion is clonal (i.e., κ or λ) and define its cell of origin (plasma cell, B cell, or lymphoplasmacytic). Immunohistochemical staining for CD138 on bone marrow biopsies is necessary to adequately quantify plasma cells. Clonal B cell populations can be characterized by presence of CD5, CD10, and CD20 on immunohistochemical staining. CD20 is usually always positive at some level in B cell clones, but CD5 and CD10 will have variable expression depending on the subtype. In addition, κ and λ in situ hybridization staining of B and plasma cells can demonstrate restricted production of the pathogenic MIg. Flow cytometry for detection of similar, as well as additional surface and intracellular markers can be performed on bone marrow aspirates or lymph nodes. This technique can detect clonal populations below the limits of immunostaining (19–21). If a clonal plasma cell population is not detected by bone marrow aspirate and biopsy and/or the offending paraprotein is IgM, a search for a B cell clone should be pursued. This includes either a computed tomography scan of the chest, abdomen, and pelvis or 18-fludeoxyglucose F18 positron emission tomography-computed tomography scan to identify lymphadenopathy for possible biopsy. We favor the latter approach as it avoids iodinated contrast, and metabolic activity may help direct biopsy to the region with the highest yield. Flow cytometry of the peripheral blood for a clonal B cell population should also be performed, which may detect clones in low-grade B cell neoplasm, such as chronic lymphocytic leukemia. How Should Response to Therapy Be Assessed in MGRS? Assessing and defining disease response in MGRS can be challenging. It is clear from the experience in MM and AL amyloidosis that improvements in these parameters are associated with clinically relevant outcomes in patients with circulating paraproteins (22,23). Although these trends have not been studied in MGRS, it is reasonable to follow paraprotein levels (with serum protein electrophoresis [SPEP], serum immunofixation, urine protein electrophoresis, urine immunofixation, and serum-free light chain assay) in cases where a detectable circulating paraprotein is present. However, since the published literature has demonstrated a low rate of detection of circulating paraprotein in MGRS disorders, the serum creatinine and quantification of proteinuria may be the only markers of disease activity that can be followed. Renal end points such as remission in proteinuria that are clinically relevant in other glomerular diseases have not been validated for the MGRS disorders. It is also unclear if a complete hematologic response is required in MGRS in order to achieve a renal response, as is accepted in AL amyloidosis (23). Additionally, relapses in proteinuria or worsened kidney function may occur, but a phased approach to “induction” and “maintenance” treatment has not been described in MGRS. Extrapolating from practice patterns in MM and AL amyloidosis, we follow monthly 24-hour urine collections for total protein, creatinine, and urine protein electrophoresis during the initial treatment phase, and every 3 months thereafter if there is an improvement in these parameters. What Are the Options for Clone-Directed Therapy? Because of the low rates of clone detection and the wide spectrum of disease severity on presentation, treatment regimens in the MGRS literature have ranged from conservative management with renin-angiotensin-aldosterone blockade alone, to a diverse array of other immunosuppressive treatments, and hematopoietic cell transplant. The International Kidney and Monoclonal Gammopathy Working Group published a consensus paper that includes treatment strategies for MGRS based on the underlying clone and disease severity (24). When MGRS exists in the context of significant systemic activity of the associated neoplasm, aggressive therapy is necessary; when the indication for treatment is solely kidney disease, a more tailored approach may be considered. There has been rapid development in therapies for both B cell and plasma cell neoplasms over the past two decades, including new drug classes that are applicable to the MGRS disorders. It is important for nephrologists to become familiar with these agents given their widespread use. Moreover, nephrologists should work with hematologists to learn about the tolerability of these agents. Indeed, many of these “chemotherapy” regimens have preferable adverse event profiles compared with those traditionally used in glomerular diseases which often include prolonged courses of daily high-dose corticosteroids. Many of these agents have activity in both B cell and plasma cell disorders and they are generally used in combination regimens. Corticosteroids delivered in short pulses at high doses are usually part of these regimens as they have excellent anti-B cell and antiplasma cell activity. The most common multiagent regimens that would be appropriate for the clones detected in the MGRS disorders include: cyclophosphamide, bortezomib, and dexamethasone; bendamustine and rituximab; and immunomodulatory agents (thalidomide, lenalidomide, or pomalidomide) with dexamethasone. In the following section, we will discuss the agents individually, including their clone sensitivity, renal metabolism, and relevant toxicities (Table 2). In conclusion, we will discuss our general principles for choosing appropriate regimens in specific scenarios, with reference to the illustrative cases. The proteasome inhibitors, bortezomib and carfilzomib, have been approved for use in MM, and bortezomib has also been approved in mantle cell lymphoma (25–28). The primary mechanism of action of these agents is to inhibit the removal of misfolded proteins in the endoplasmic reticulum, resulting in induction of the terminal unfolded protein response and cellular apoptosis (29). As single agents, bortezomib and carfilzomib have overall response rates of 30%–50%, depending on the phase of disease and prior therapies (26–28). Bortezomib is the preferred agent for MGRS as it can be given at full doses in renal insufficiency without renal toxicity (30). The toxicities of bortezomib are very manageable, with serious peripheral neuropathy occurring in approximately 6% of patients with subcutaneous administration (31). Although carfilzomib can be given without dose reduction in renal insufficiency, it has been associated with AKI and rare cases of thrombotic microangiopathy, and thus should be used with caution in patients with MGRS (32,33). Prophylaxis against herpes zoster reactivation is mandatory with both proteasome inhibitors. Monoclonal antibodies are a revolutionary class of drugs. They target specific surface markers on the clonal cells resulting in cytotoxicity through numerous mechanisms, including antibody-mediated cellular cytotoxicity and antibody-dependent complement cytotoxicity. This class of drugs has a very favorable toxicity profile, with the majority of toxicities related to infusion reactions. They can also be given at full doses in renal failure. Rituximab is a monoclonal antibody directed at CD20, which is present on the surface of benign and malignant B cells, including in chronic lymphocytic leukemia, non-Hodgkin lymphomas and Waldenstrom macroglobulinemia (34–36). In these diseases, the response rates for rituximab alone vary considerably from 20% to 50%. Daratumumab is a monoclonal antibody directed at CD38 that was recently approved for treatment of relapsed MM, where it has remarkable activity as a single agent in heavily treated patients, with an overall response rate of 29% (37). To our knowledge, there is no published clinical experience with daratumumab in MGRS. Traditional cytotoxic agents, such as cyclophosphamide and melphalan, target both plasma cells and B cells and are excellent options for consideration in MGRS. Cyclophosphamide is generally more useful than melphalan. Although dose reduction for renal insufficiency has been employed in the treatment of rheumatologic disease, cyclophosphamide is routinely prescribed at full doses in patients with renal insufficiency who are receiving treatment for lymphomas, MM, and/or AL amyloidosis. It is also not toxic to hematopoietic stem cells and thus combines well with other agents. Melphalan is typically used in high doses as conditioning for autologous stem-cell transplantation and is the preferred conditioning regimen for plasma cell disorders. Conventional doses of oral melphalan should be avoided in patients who are potential candidates for autologous stem-cell transplantation as it may prevent collection of adequate stem cells. Bendamustine is another cytotoxic agent that shares features of alkylating agents and purine analogs, and has been approved for use in various lymphomas and also has activity in MM due to its broad activity (38–41). Its metabolism is predominantly nonrenal and has been given to patients with poor renal function and ESRD. In the context of low-grade lymphomas and Waldenstrom macroglobulinemia, the regimen of bendamustine and rituximab has excellent activity, with overall response rates of approximately 90%. The immunomodulatory agents, thalidomide, lenalidomide, and pomalidomide, are active against both plasma cells and B cells and have been shown to have activity in MM, chronic lymphocytic leukemia, and mantle cell lymphoma (42–46). However, their use in patients with renal insufficiency is challenging. Thalidomide has been associated with unexplained hyperkalemia in renal failure. Lenalidomide is dependent on renal clearance and the dosing is not well established in renal insufficiency (47–50). In addition, there have been reports of worsening renal function in patients with AL amyloidosis treated with lenalidomide (51). The renal dosing of pomalidomide is unknown. The purine analogs, fludarabine and pentostatin, have excellent activity against B cells and are generally combined with cyclophosphamide and rituximab, yielding overall responses in chronic lymphocytic leukemia of >70% (52–54). However, these agents are associated with severe myelosuppression, opportunistic infections, and secondary myeloid neoplasms. Because some active metabolites are cleared renally, purine analogs are not recommended in the setting of eGFR<30 ml/min per 1.73 m2 due to concern for increased adverse events. Therefore, we avoid the use of this category of drugs in MGRS. Ibrutinib is a novel inhibitor of Bruton tyrosine kinase that has excellent activity (overall response rates exceeding 70%) across B cell malignancies and has been approved for CLL, mantle cell lymphoma, and Waldenstrom macroglobulinemia (55–59). It is an oral agent that lacks myelosuppression but is associated with bleeding events, musculoskeletal pain, and atrial fibrillation. Renal excretion of ibrutinib is thought to be minimal, but it has not been studied in severe renal impairment. Delivering chemotherapy in myeloablative doses with autologous hematopoietic stem-cell support has been shown to overcome chemotherapy resistance and is associated with improved progression-free survival in MM (60,61). High-dose melphalan can be delivered in the setting of renal insufficiency and hemodialysis with acceptable morbidity and mortality (62). Our general approach is to make all reasonable efforts to identify a specific clone to treat as described above. Here, we will describe three illustrative cases of patients who presented with nephrotic range proteinuria and renal insufficiency. Patient 1 (Table 3) was diagnosed with PGNMID with IgGκ deposits on kidney biopsy. A hematologic workup revealed an IgGκ monoclonal protein on SPEP and the presence of clonal B cells in the bone marrow and peripheral blood. She did not have constitutional symptoms or lymphadenopathy, so she did not meet the criteria for systemic lymphoma. Her proteinuria was improving with steroid monotherapy, and we administered a course of B cell clone-specific therapy with rituximab to consolidate this response, which has been sustained for >3 years. Patient 2 (Table 3) was found to have PGNMID with IgGλ deposits on kidney biopsy. A SPEP detected a circulating IgGλ paraprotein. A bone marrow biopsy did not show an expanded or restricted plasma cell population by morphology or immunohistochemistry, but a small, λ-restricted plasma cell clone was detected on flow cytometry of the bone marrow aspirate. An antiplasma cell regimen with cyclophosphamide, bortezomib, and dexamethasone was used and he achieved a rapid renal response with a partial hematologic response (i.e., his SPEP still detected the paraprotein). 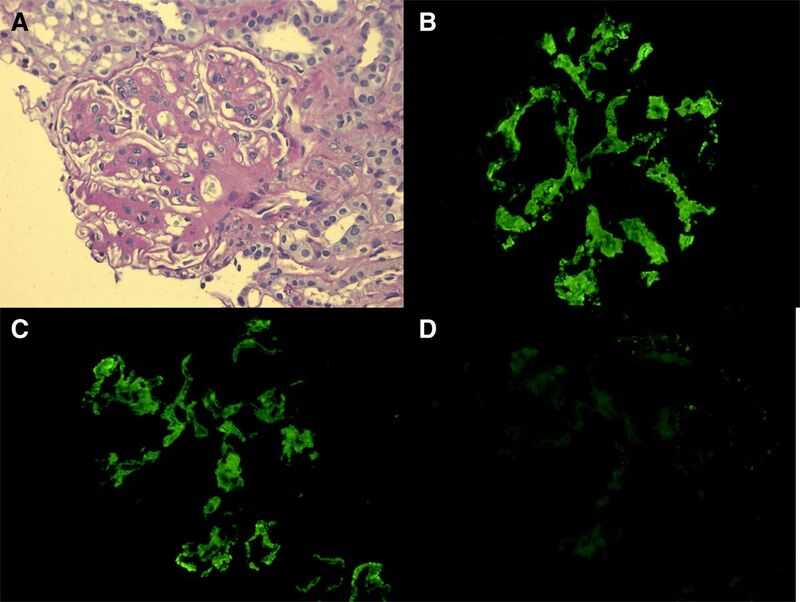 Patient 3 (Table 3) was found to have diffuse endocapillary and proliferative membranous GN with monoclonal IgGκ deposits on kidney biopsy. No circulating paraprotein was detected, and a bone marrow biopsy did not detect the presence of a clone. Since no clone was identified, we empirically chose a regimen that targets both B cell and plasma cell clones, with the hypothesis that a clone existed that was below the limits of detection. She received rituximab, cyclophosphamide, and prednisone, resulting in a rapid and deep reduction in proteinuria and improvement in her eGFR. We should note that if the pathogenic heavy chain of the paraprotein is IgM but no clone is identified, rituximab-containing regimens are a logical choice of treatment since IgM molecules are generally produced by B cells, which are CD20 positive. It is unclear whether a complete hematologic remission is needed to improve organ damage in MGRS; thus, both hematologic and renal parameters should be followed closely to guide therapy. We generally treat for two cycles past the best renal response. In order to understand these (presumably) rare conditions, comprehensive, standardized, and sensitive diagnostic evaluations need to be performed, as outlined above. New assays in the detection of paraproteins, such as the serum heavy/light chain assay, should also be evaluated in the detection of paraproteins in MGRS (63). Standardizing clone-specific treatments is also essential. As many nephrologists are not familiar with some of the agents described above, and renal outcomes remain poor for many patients with MGRS, a collaborative onco-nephrologic approach should be utilized to develop these regimens. Prospective trials assessing these treatments and standardized response assessments are also needed, and a reasonable empirical therapy for those without an identifiable clone is needed. Exploring novel diagnostic tools, such as next generation sequencing, should be considered to identify very low levels of B cell or plasma cell clones (64,65). Multi-institutional collaboration would be instrumental in conducting these types of studies. J.J.H. has nothing to disclose. B.M.W. has received research support from Janssen Research and Development (Spring House, PA) and Prothena Biosciences (Dublin, Ireland) and consulting fees from Janssen Research and Development, Millennium (Boston, MA), Prothena, and Novartis (East Brunswick, NJ). Many helpful discussions informed this work and the authors are grateful to Adam D. Cohen, Dan T. Vogl (master of science in clinical epidemiology of the Abramson Cancer Center, Division of Hematology-Oncology at the University of Pennsylvania), and Laura M. Dember of the Division of Nephrology, University of Pennsylvania.